May the mind of Christ, my Savior, Live in me from day to day, By His love and power controlling All I do and say. May the Word of God dwell richly In my heart from hour to hour, So that all may see I triumph Only through His power. May the peace of God my Father Rule my life in everything, That I may be calm to comfort Sick and sorrowing. 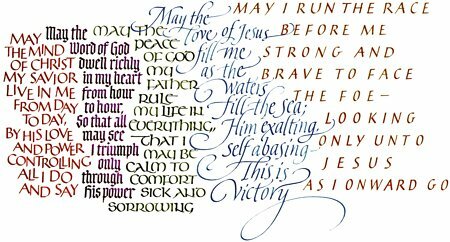 May the love of Jesus fill me As the waters fill the sea Him exalting, self abasing, This is victory. May I run the race before me, Strong and brave to face the foe, Looking only unto Jesus As I onward go.